Bill Gates is a modern business phenomenon: the greatest of the techno-savant tycoons. His grip on the PC software market has made him the richest man on the planet. But Gates'wealth and technical brilliance is only part of his fascination. His remarkable business vision and obsessive desire to win has created a headership style that radically different to anything the business world has seen before. But you won't find many clues to the Gates' management or leadership techniques in business schools. So where do we turn to find out how this guy ticks? Beneath the hype and counter-hype, what sort of man is Bill Gates really? 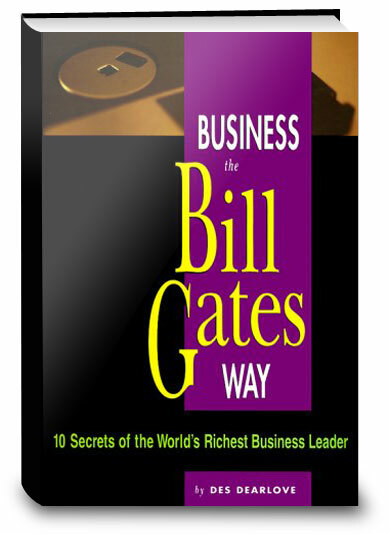 Brought completely up to date for this new edition, Business the Bill Gates Way not only reveals the secrets of Gates' remarkable success but also draws out the universal lessons and identifies strategies that can be applied to any business or career. From hiring very smart people to loving what you make, and from crushing your competitors to never, ever, ever taking your eye off the ball, you have in your hands the secret of phenomenal success. Click the button below to add the Big Shots, Business the Bill Gates Way to your wish list.